This part of the Western Algarve, with the town of Aljezur as the center, will leave you stunned and alive and makes you feel old and refreshed, all at the same time. 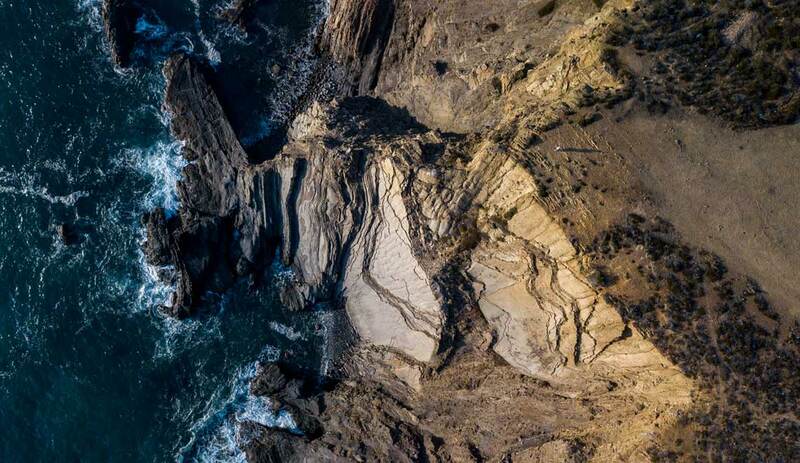 The raw nature displays rugged cliffs, playful river-mouths, bizarre tidal rocks, and energetic ocean, turning into pine-tree filled hillsides, scattered farmland, age-old settlements, and newly born surf towns. Days kick-off with brilliant sunrises over valleys, filled with mysterious fog, and they end with the most epic sunsets you will ever see. 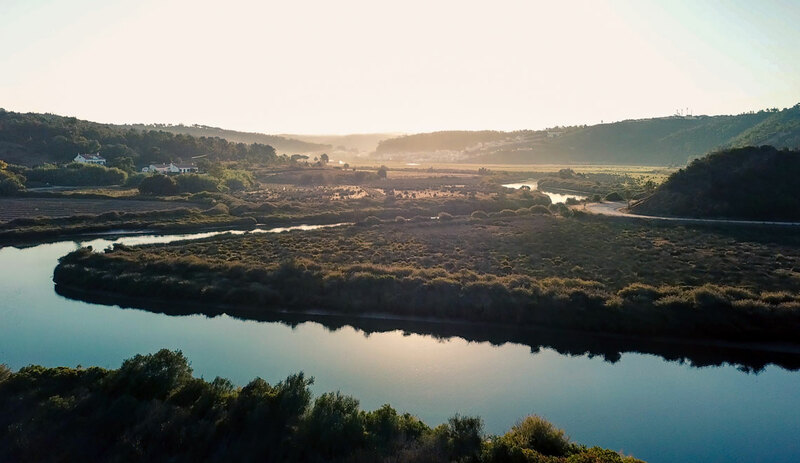 After reading this article, you should be convinced to at least visit Aljezur once during your vacation in the Algarve. But if you are a nature and surf lover (like me), you can easily spend a long vacation there. The Western Algarve has arguably one of the most impressive coastlines of mainland Europe. It is still relatively unknown because of the popularity of the rest of the Algarve, where the masses flock in the summer months. 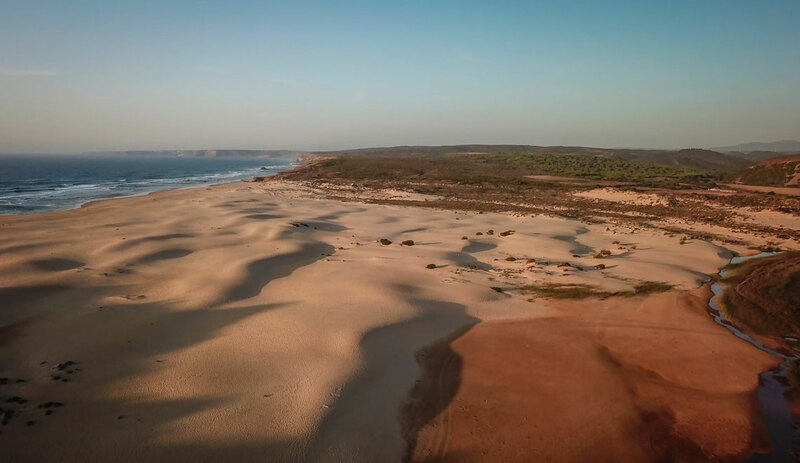 Protected by a Natural Park status, the Western Algarve will likely remain like this for many years to come. Thank you, Portugal. 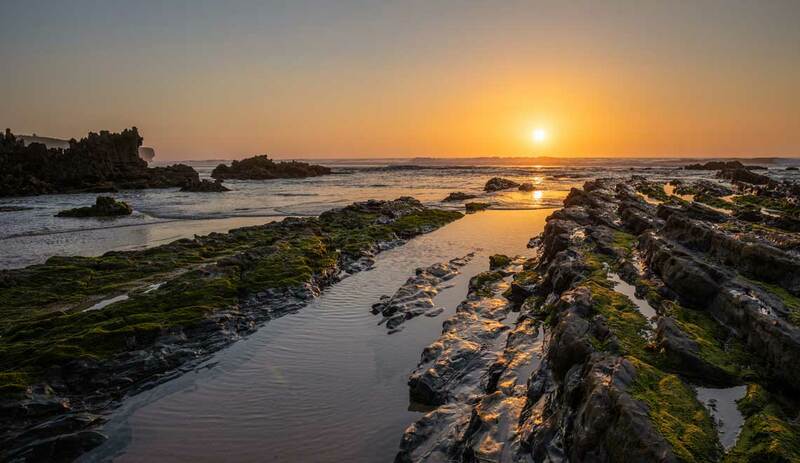 For your information: the National Park is called Southwest Alentejo and Vicentine Coast Natural Park. 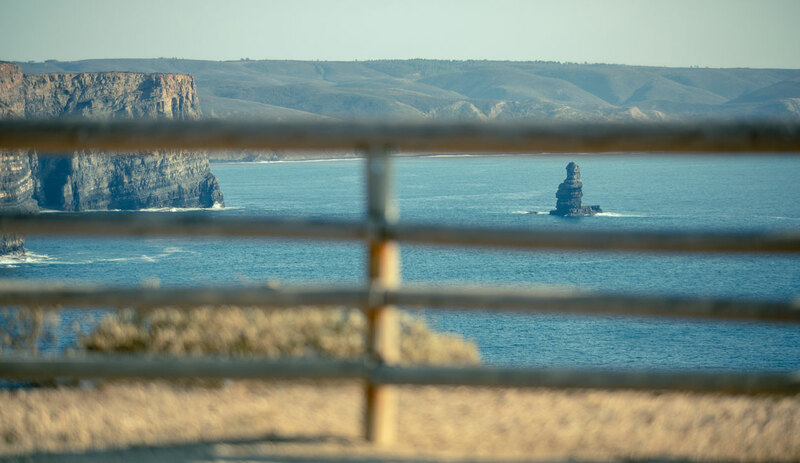 It consists of 3 parts: Concelho Vila do Bispo (more or less from Burgau to Sagres), Concelho Aljezur (from Carrapateira to Odeceixe), and one part is within the Alentejo region (from Odemira to Porto Covo). The Aljezur valleys and coastline can get foggy, but mostly in the winter time. In the summer months, it usually shows up in the morning and clears up around noon. 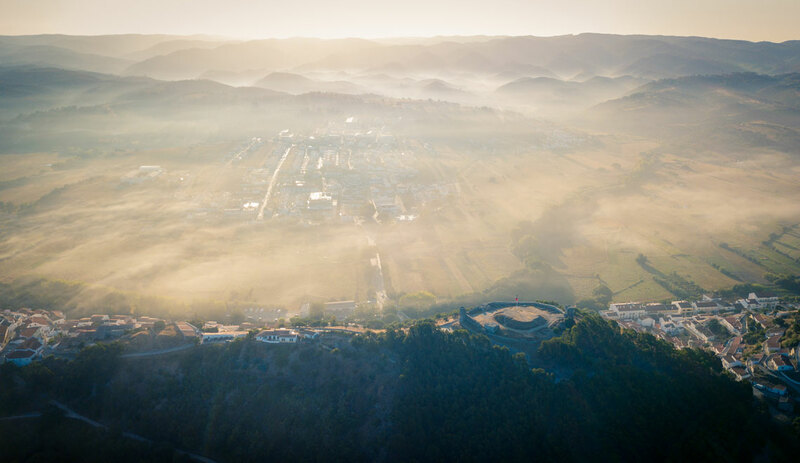 With the sun rising above the mountain range of Serra de Monchique, and the fog hanging low in the valleys, it creates surreal scenes. It’s worth getting up before sunrise and visit a lookout. The Moorish castle in Aljezur is a great spot. People populated this area since prehistory as its rivers, valleys and coastline are ideal for hunting, fishing, and agriculture. Unfortunately, nowadays the droughts leave parts of the rivers dry. The area is famous for its sweet potatoes, and in restaurants, I suggest to always order the fresh fish. As you drive around the area, you can’t help but notice the large fields of pine trees. They are common in Portugal and can actually slow down wildfires. You will see lots of newly planted trees as they are under constant attack by the drought, an annoying worm, but also the wildfires. Somebody told me that landowners get subsidized for planting the pine trees. And thankfully so, as they light up the often dry landscape with its bright green color, especially at golden hour. The municipality of Aljezur has 40 kilometers of coastline. In the summer, the extreme tides (more than 3 meters difference) have a major impact on your beach experience. The high tide creates lagoons, fills up rivers (for safe swimming), and creates fun waves for body surfing. The low tide exposes the large tide rocks and creates otherworldly landscapes. Often, from the beach, you can hike up and down the cliffs. Be careful as the Portuguese coastline suffers from erosion so follow paths and instruction signs. The views from the cliffs are simply stunning but can be scary for those afraid of heights. There are many hiking trails that can lead you to hidden beaches and vistas. Portugal is a world-renowned surf destination with over 200 surf spots. Aljezur is less known then areas like Peniche and Ericeira but it is growing. Almost all beaches in Aljezur offer excellent surf catering both the beginner and the experienced surfer. The variety and angles of beaches make sure you can find a spot for any type of swell. 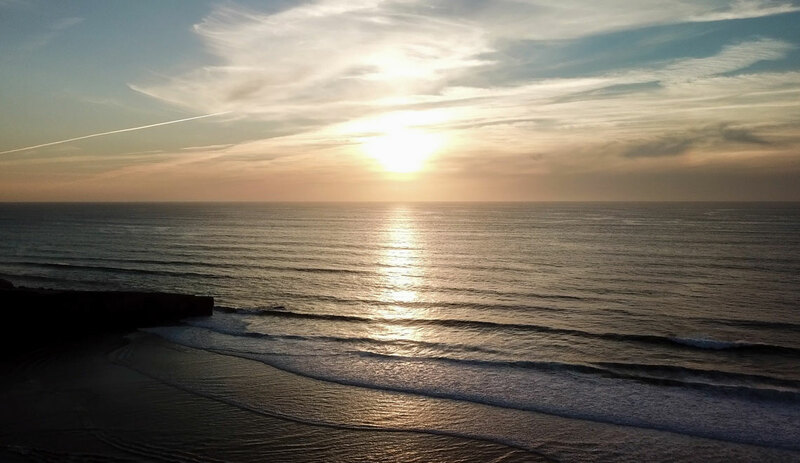 The towns are adopting surf tourism and are turning into bonafide laidback surf towns with boutique restaurants, hostels, surf camps, and surf stores. The Amado and Arrifana beach breaks are the most well-known and therefore (over)crowded in the summer months with surf camps teaching backpackers and surf dude/ babe wannabees to ride their first waves (well, they ride the foam, but it still counts). Luckily, there are many other surf breaks where sometimes you find you are actually the only one out in the water. Also, most beginner classes stick to the foam near the beach, so there are plenty of opportunities for you to catch a wave out the back. Beaches like Bordeira and Amado have so many peaks, you will have no trouble finding one for you and your friends to enjoy. In the winter months, the swells pick up and the tourists and beginners are long gone. The most famous castle in the region is the Moorish castle. It is well-preserved and overlooks the town of Aljezur. It is quite easy to get there and a nice hike through the historic center of Aljezur. When strolling around castles like this, you can’t help but feel insignificant. Hundreds of years, people have walked this earth, grown crops, fed their families, and fought battles. 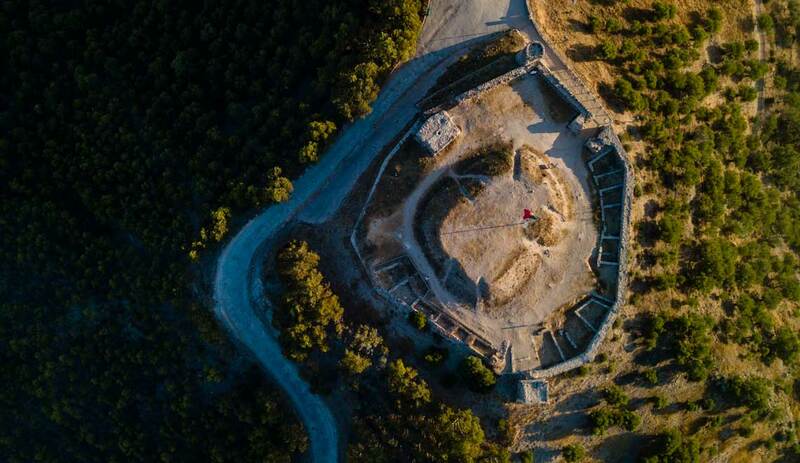 The days of kings and queens are long gone and replaced by tourists, running around with cameras and flying drones so we can share our travel stories online. It makes you think about hundreds of years from now. Who will be walking that same earth and how do they look back on us? There are several other forts to visit in Aljezur, like the one at Carrapateira and one at the end of Arrifana on the cliff. The buildings aren’t too impressive, but combined with the surrounding scenery, they are. When exploring the hiking trails on the cliffs, keep an eye out for ruins. You never know what you might find. Somehow, nature provides amazing sunsets in Aljezur. I am not sure why. Of course, the cliffs help you with a better view of the large and seemingly endless ocean. But those colors in the sky must be a combination of the mist coming from the land, the ocean, the spray of the waves, and the clear skies. Almost every day is a new miracle with colors ranging from pink, to red, and all the blue hues imaginable. Another big advantage compared to the southern beaches of the Algarve: the sun actually sets in the ocean. Priceless. For more information, visit the official site of Aljezur. The Weather in Curacao: When is the Best Time to Visit?